Some places are simply breathtaking at first sight and our exclusive island on Lake Garda will capture your hearts from the word go ! Close your eyes for a second as a private boat whisks you across the blue waters of Lake Garda, enjoy this magical moment as you go to pledge your love for each other.Open your eyes as this magical island rises to greet you, you will realize that dreams really can come true. 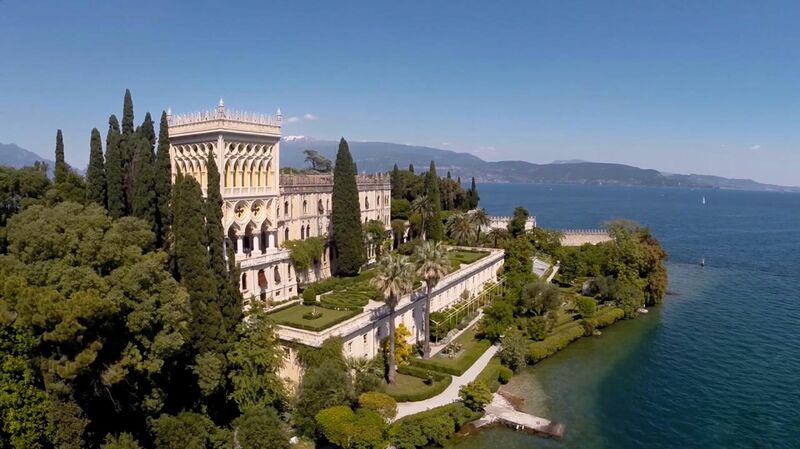 This luxury location, once a monastery and now the private home of the Cavazza Family, is without a doubt a WOW factor location for your Wedding on Lake Garda. 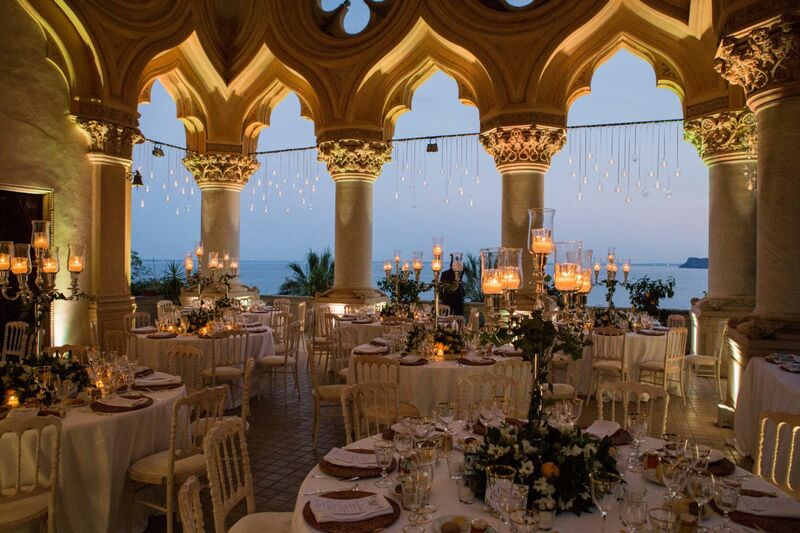 Accessible only by boat and surrounded by the sparkling waters of Lake Garda & spectacular mountain scenery, the island offers secluded privacy for a unique wedding in lavish luxury. The island is available for exclusive hire where you can celebrate your ceremony and reception in the one location really making the most of this special place and your special day. The Venetian gothic/baroque style villa with lakeview terrace can comfortably hold your ceremony or/and seated reception for up to a hundred guests. For larger numbers, a marquee is avaialble. The loggia overlooking the lake is the perfect setting for your vows followed by an aperitif in the beautiful Italian Gardens.Return to the lakeview veranda and loggia for your wedding banquet followed by dancing and a great party down by the lake shore. Should you wish you can also hire the island just for your civil ceremony only returning to another lakeside venue for your reception. The villa is full of 18th Century works of art and a treasure chest of antique furniture and ornaments. Full of magic and mystery monks resided here for centuries and it is said that even S.Francis of Assisi walked through its very woods. Now you can become a part of Isola’s history sharing this aristocratic home with the Cavazza Family ,relatives of the Duke of Shrewsbury. The beautiful English & Italian style landscaped gardens and terraces are filled with flowering shrubs and bushes, elaborate hedges, wonderful exotic plants and palm trees.The surrounding woods of cypresses, acacias, pines, agaves and magnolias guard the beauty and true jewel of this Island- the extraordinary lavish villa. The island has no accommodation however numerous resort locations around the lake are easily reached by boat and offer a wide range of suitable accommodation for your guests. Saying I Do in this magical location ,your guests will tell you for years to come that it is easily the best wedding they have ever been to ! Words alone can not describe the beauty of this property and as you leave the island as husband and wife , memories of this truly stunning location will stay in your hearts forever. 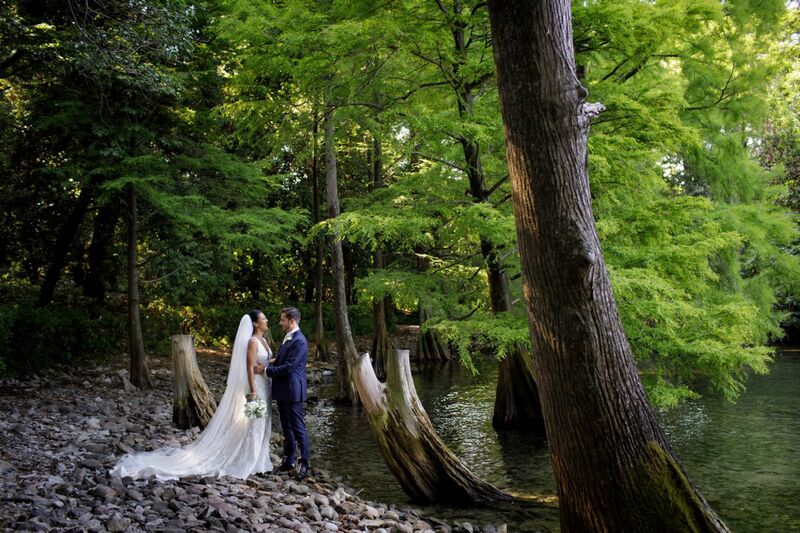 Isola del Garda for your wedding day is truly where your very own fairy tale turns into reality. A Stunning Isola del Garda Wedding. Can't wait to share it with you . That's Amore !